Aryan, Sara and Navya: Did Celeb Kids Out-Style Their Parents At The Ambani Bash? Before you wonder, the answer is ‘no’. No, we’re not over the big, other-worldly Ambani-Mehta engagement yet. Partly because it’s a Monday and we, kind of, don’t WANT to get over it (better than burying our faces into excel sheets). Partly because, for a change, we got to lay eyes on the most coveted celeb kids out for a wedding function with their parents. Just like we’re dragged to weddings by OUR parents! While for us it’s been a drag, these Insta-famous celeb kids look very comfortable walking the red carpet at the biggest engagement of the season (sorry, Sonam). We rarely see Aryan Khan go dapper for a wedding function and boy, did he bring his A-game. As King Khan posed alongside his son and we couldn’t help but do a quick comparison. 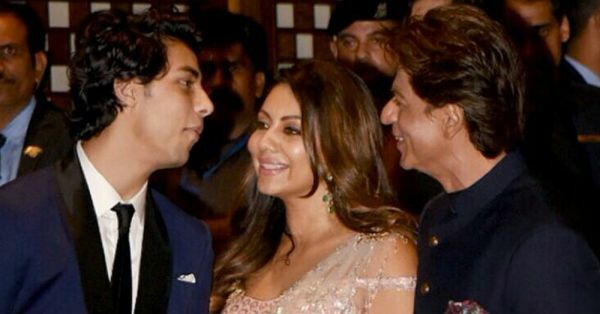 And while Shahrukh did look incredible in a navy and white bandhgala-pyjama combination, Aryan out-styled his dad in a dapper blue and black tux. P.S. Both wore custom Masculine Official. Like mother, like daughter? Not this pair. 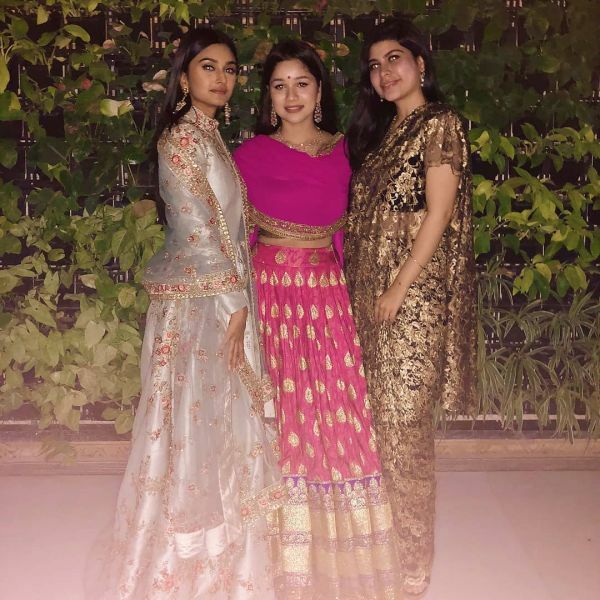 Navya and her mom may have picked the same designer duo to dress them for the big Ambani engagement, but they were not even close to twinning. Shweta Bachchan Nanda rocked a contemporary pleated pallu saree, by Abu Jani Sandeep Khosla, which she wore with a bejewelled bustier. Navya, on the other hand, went with a blingy green-gold saree and nailed the look. Close, but we give this one to Shweta - we love how she struck a balance! Everyone who is someone was there at the Ambani bash on Saturday. The God of cricket, Sachin Tendulkar, is no exception. 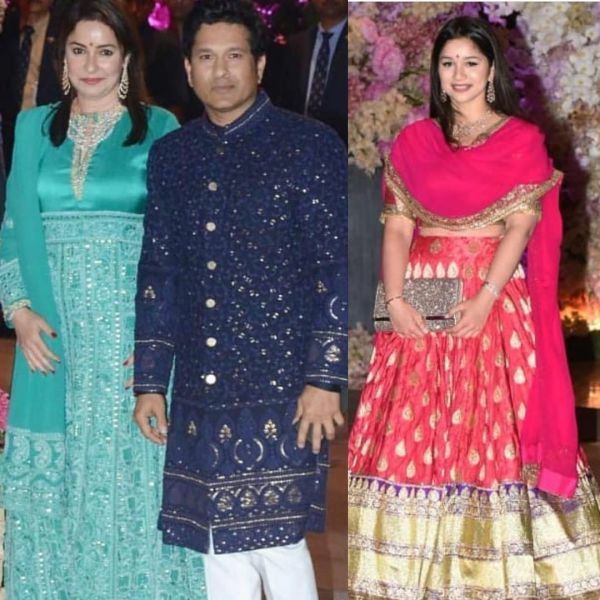 Sachin attended the engagement party with his wife, Anjali, and his daughter Sara, who is doing rounds on Instagram lately. Anjali Tendulkar picked a teal anarkali which we are personally not big fans of. Her daughter Sara wore a pink and red Benarasi Manish Malhotra lehenga. Clearly, Sara is the clear winner. 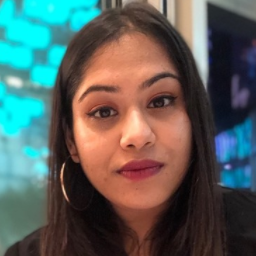 Better luck next time, Anjali! Other star kids who were present but were either too young for a comparison or unaccompanied by their parents are also worth a mention here. Sara Ali Khan wore a cream and orange Abu Jani Sandeep Khosla lehenga. Unfortunately, Amrita Singh or Saif Ali Khan wasn’t present. 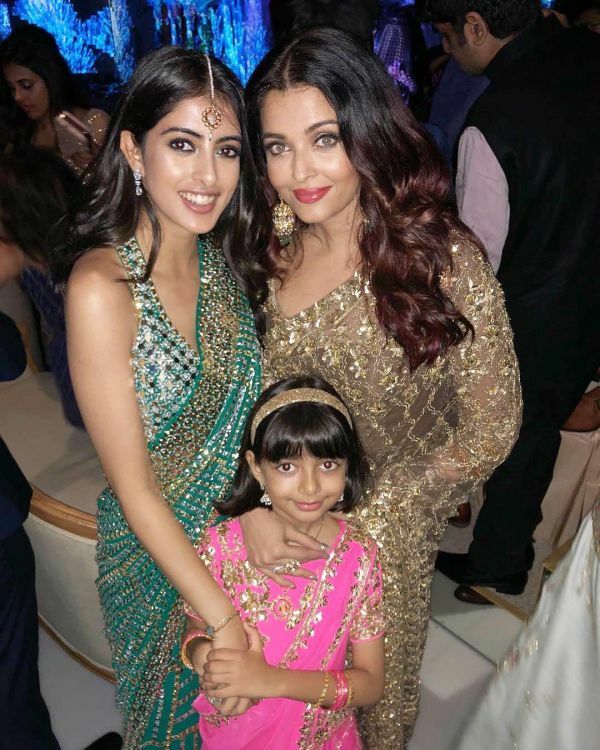 Aishwarya Rai Bachchan’s little one, Aradhya Bachchan, also wore a pink lehenga by Bollywood favourite, Manish Malhotra. You know what they say, start em young! If only, Bollywood would adopt us! Not TOO late, is it?